← Would you like some room for cream? LinkPeelr has been fine and dandy. So fine, in fact, that I feel a pressing need to tell you about its progress. This is a long post — sit back and enjoy! When I started on LinkPeelr I thought it was a neat and compact idea, and a small enough project I could actually tackle myself. I ended up launching LinkPeelr after 3 weekends of work, but I never intended for it to evolve far beyond the small project that it was. From day one I viewed it primarily as a “pipecleaner”, an app that could help me test my own ability to go from problem to launch and prepare me for more ambitious things that I’ve had simmering on the back burner. Needless to say LinkPeelr has quickly outgrown its purely experimental intent, managing for a few weeks to eclipse everything else I was thinking about and working on. This period has been a period of rapid learning, and something that I enjoyed immensely. Although I obviously set out to make LinkPeelr a learning experience of sorts, I never anticipated that this learning would come at this pace and intensity. What follows is an account of what happened after I launched LinkPeelr, and what I’ve learned in the process. After hitting 1400 words with this post I realized that “what’s next for LinkPeelr” section had better come in its own separate write up. When I built LinkPeelr I’ve done some cursory research to at least see what similar tools were out there already. I didn’t care much for competition because I was primarily competing with myself in getting the app out the door. I wasn’t not planning to steal someone’s users, and I don’t think I ended up doing that either. However, if I actually planned to get users I would be deterred by competition before writing the first line of code, and if I chose to go ahead anyways, knowing that I am up against established apps that do it better, have more users, and have been around a lot longer would be a crippling position to start from. In practice, I realized that the niches are bigger than they seem. The spaces between “adjacent” or similar apps are actually wide open, and there are ample users and opportunities to be had there. The app ecosystem is like a chunk of matter that looks solid to a human eye but is actually porous all the way down to the spaces between the nucleus and the electrons. If you are crafting something small, and thinking about a user base that’s less than (perhaps (?)) 50,000 users, I think you’ll find that these opportunities are plentiful. They are not viable businesses per se, but they represent infinite playgrounds where you can flex your muscles and learn things that will help you tackle bigger problems in the future. At least that’s the path I am trying to follow myself. Getting out there and promoting the app was remarkably easy. All I did was contact the websites listed here. I filled out the forms, and forgot about it for a few days. I explicitly avoided the sites that promoted startups, since I wasn’t a startup. Not one replied. They just posted their reviews, and so it began. For reasons beyond me the first coverage was in Italian and Czech, so I got a huge (at least it seems that way at the time) bump in traffic to the site from those countries. To give you some perspective I got about 100 visitors on the day of each review (there were 3 or 4 rather small sites that mentioned LinkPeelr), and the number of extension users slowly climbed from 1 to 100. I was ecstatic. It was a big success, and I thought that was about as good as the app could do. Then on November 8th, I got covered by Lifehacker. I wasn’t even sure I pitched them the app, they just happened to review it. Let’s just say it changed some things. 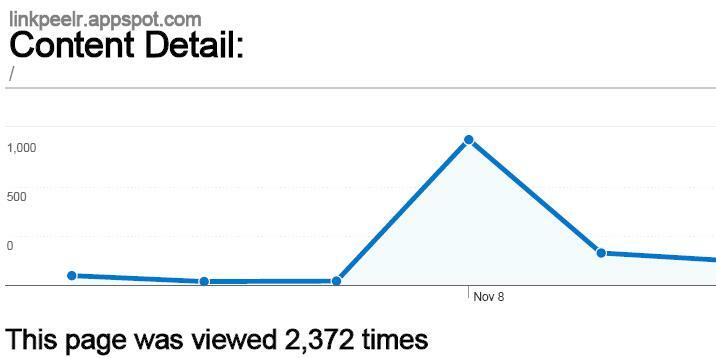 I got ~1000 visitors on that single day (note the Y axis in the next pic). From that point on and up until Thanksgiving the number of users was steadily growing at 200 users/day, and I hit 3000 user mark in about two weeks (since then the weekly installs have slowed to 250). The oddest part of the experience was how easy it is to promote your app. Arguably, I didn’t get very far on the global scale of things, but I still got about 1000% farther than I expected. The fact that some editors took the time to write about LinkPeelr was mind-boggling as I was convinced that no sane person would ever waste their time trying out the app, and writing and editing a review. Granted it wasn’t TechCrunch reviewing LinkPeelr, it did well for a 3-weekend project. The fact that there was any coverage was already an eye-opening experience. In the end it turned out that the Internet is desperate for newsworthy content, and it will jump at every opportunity to cover literally anything (and I suppose there is also an audience for literally anything). That was another big surprise. One of my early worries (when I would get the dazed look and imaging everything LinkPeelr could become) was that no one would want to use it for the lack of features. Classic mistake! Not one of my users complained that the app didn’t have such and such feature. Mind you, this is an app that literally has 1 feature. It’s true that people complained about the specifics of how this one feature was implemented and how it worked in different configurations but they never asked for the app to do more. This in some ways is completely counterintuitive, but in others it speaks volumes about the value of focus. Focus on one thing. Do it well, and no one could fault you for being too narrow minded. I effectively built the app for myself, and I made it do everything I needed from it. This turned out to be representative of the problem that at least 3000 other people were facing. They didn’t need a toolbox of features, they needed a direct hit. The other similar Chrome extensions I looked at had tons of features. And although it helps to be feature-ful (as evidenced by their healthy user bases) it also hurts your chances of crisp and straightforward positioning. What do those apps do? Well, they do this, that and the other and a 100 other things, which dilutes the value proposition and effectively hides the app from people looking for a more specific solution to their problem. So everyone has a story about users shattering assumptions. Lean startup insists on getting out of the building and facing the user head on. The newbies like myself take this advice for granted, and when we buy into it, we buy into it like we buy into like a scientific fact, which is not the same as running the experiment ourselves. Nothing prepares you for the unpredictability of user feedback. Ok, let me say this again: LinkPeelr is a 600 line program (not counting .css and .html). When I launched it, I thought I knew and understood every implication of every little sub-feature in any configuration that could ever arise. I knew this was the first version and when I launched I already had a list of bugs to take care off later. Wait for this! The first negative feedback that came back and was repeated over and over again was to remove a feature. I kid you not. Nobody seemed to care for the toolbar icon the extension placed in Chrome. Why? Because people had tons of extension installed already, and it shortened their address bar. I kid you not. It wasn’t stability, it wasn’t performance, it wasn’t the features. It was the freaking toolbar icon that had to be removed. By the way, the toolbar icon and the popup page behind it was one of those 3 weekends I spent working on the app. Thankfully, it only took 15 minutes to disable. But think about this: if LinkPeelr is representative of a greater user feedback experience, then you are now building features people will hate. I didn’t think it could be possible for LinkPeelr, because it literally didn’t have any features, and boy was I wrong. The best part of all of this, of course, was getting user feedback. For every quip about the toolbar icon there were dozens of “awesome!”, “great extension”, “thanks a lot, man”. 62 people (none of whom are my Facebook friends) liked it on Facebook. There were hundreds of tweets and re-tweets in languages I don’t know (all favorable, mind you) mentioning LinkPeelr. The extension is now “peeling” 25K links per day, an average of about 10 links per every user. For a humble and simple piece of software I built over 3 weekends LinkPeelr has not only exceeded my wildest expectations, but also provided me with a rare opportunity to learn firsthand what building and launching a web application is really like. I leave with you with the image of API traffic bouncing along with the American workday. This entry was posted in startup and tagged launch, product design, product marketing. Bookmark the permalink.